DOES DRIVING A NEW CAR PREVENT GETTING RICH? One of the most popular articles on this website is How Trading in a Car Every 2 Years Makes Good Financial Sense. It’s ironic that this is such a popular article, as my husband’s “new” car is a 2003 with 90,000 miles on it. My car has almost 120,000 and is still in great condition. That article talked about a man I met who valued driving a new car. In fact he preferred to drive a new car over taking a vacation, eating out, and almost all other indulgences. He wasn’t at all reckless, in fact he owned his own condo, had minimal debt and lived within his means. Can I Trade in a Car & Get Rich? I heard a woman CEO bluntly state that women can have it all, just not at one time. That statement epitomizes how to live well now and become wealthy later. You must decide what is most important to you. Very few people can afford to buy whatever they want. If you want a new car, it’s likely you’ll have to cut back somewhere else. Life is all about choices and trade-offs. Even folks looking for an expensive apartment to buy in NYC, can’t get everything they want. If you want to eat dinner out frequently, you may not have the cash to take a Hawaiian vacation. If you value buying season tickets to the pro football team, you may not have the cash left over for an iPhone. My uncle Joe and his wife bought new cars and traded them in every six or seven years. In order to afford the cars, they ate out infrequently and when they did go to a nice restaurant, they split a meal. The way to become wealthy is to separate your most important priorities, from items you can give up or buy later. I don’t care what I drive. In fact, I’d be content never to buy a new car, I resent paying for the inevitable high priced car insurance coverage that goes along with a new vehicle. By spending the minimum on our vehicle expenses, we can afford to save, invest, and take nice vacations. I also indulge in frequent visits to the salon as my splurge :). You value and appreciate the experience of driving a new car. You are willing to cut back spending in other areas so that you can afford a new car. You aren’t carrying lots of debt and can afford a new car. You can sell your old car yourself (and get a better price than you would from a dealer). You can negotiate an excellent price on the new car. You can afford to save for the future and still purchase the car. 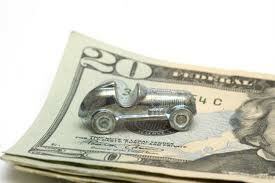 If trading in your car for a newer model makes good financial sense, then enjoy it! If you can’t swing it financially right now, save up in other areas so you can buy a new car later. Make the decision whether to buy a new car rationally and remember, every decision you make involves a trade-off. What are your thoughts about trading in a car? Do you like to drive a newer car? I agree with you that you should value your priorities, and if having a new car is it, there’s nothing wrong with that! But it’s still not usually a good idea to *trade in* a car — you can usually get more for it by selling it privately. @Little, That is such a great strategy. Where we live, lots of folks take their bikes on the trains and buses. Great exercise, good for the environment, and low cost! @Jackie, I totally agree, sell your car yourself and net greater profit. You’re right it is all about the choices you make in life. One of my choices is to travel overseas every other year, but it did not stop me from accumulating significant savings. I don’t care to drive a new car so I spend my money elsewhere. However, I prefer that Cheryl drives a newer car. She’s not handy at all and has a job where “getting there” without a hiccup is a priority. So, we drive my car into the ground and buy a new one for her every few years. I would argue that if you’re getting a new car every few years, you should never trade in your “old” car. Dealerships won’t give you a good deal on a trade in, and a lightly used car is still worth a lot of money in the private market. The difference between what the dealership offers you and what you could get on Craigslist is going to be pretty big. If you’ve got a 15 year old car that’s only worth $500, I’d trade it in just to save myself the effort of trying to sell it myself. @Krantc-I really like to travel as well. Haven’t been to Asia yet, but it’s on my list. @JOe-Sounds like a well thought out plan! @Gen Y-Sound advice. WE always sell our vehicles ourselves. Although, I may donate my car when I’m finished with it. Great post. I wish I could learn how to ride a bike to help save the environment and save money on gas, too. Unfortunately, no matter how I try, I fail. At any rate, I do not mind trading my car for a newer one as long as it will cover half of the down payment and the monthly amortization will not go beyond the budget. @Cherleen-You have to keep trying. Riding a bike is fun, good exercise, and saves gas :). I would agree with Jackie. If you really need/want a new car, than get one. You need to do what is important to you. I know for us we buy used cars from family and then drive them into the ground. It works well. You make a very great point. I believe that cars should only be used to get from point A to point B and not for comfort. However, that is my personal preference and I spend a lot more than the average person on food and supplements because I value my health tremendously. One could argue that you should eat as cheaply as possible and drive a nice car. It’s all about persepective, thank you for reminding me. @Miss T and BRick by Brick- Thanks for promoting the idea that each of us pends on what matters personally. If you want a nice car and it’s important to you, great, if not, then spend on what matters to you. I’m a fan of driving cars until they expire, then selling them privately before buying a new car. A person can probably make a few thousands bucks by going with a private sale. However, there is no problem with getting a new car if you have your financial house in order and are on target to hit your goals. @Dominque-Our values are in alignment!! 🙂 But, as you said, if you want a new car frequently and can meet your current and financial goals, then why not? I have to say I’m surprised. As a total car nut, I would NEVER buy a new car, unless it was the latest Ferrari hypercar or similar, otherwise it loses money as soon as it comes off the forecourt. If you like that new car smell and feel, to me that’s just good valeting and proper maintenance. You get that from any well looked after used vehicle. In fact, when I sold my wife’s car, I got 20% more than she paid for it, simply by cleaning it until it was spotless, both inside and out, and showing a file of receipts to prove it was well cared for under us. Hi Matt, I’m with you. But this just shows that everyone makes their own money choices and there are no wrong answers. Just make a decision deliberately, understand the consequences. If you buy a new car regularly, you need to cut back somewhere else. Life is full of choices.I consider not to buy a car at all for I can’t afford it.I’m saving for my children’s future and it is all that matters to me now.I’d rather buy a used car than a new one.The car value depreciates fast. first things first, set out your priority. I agree with SMAT if you can’t afford and just want to squeeze your budget just having a new car, think about it. We bought a new Prius late last year mainly because my wife said that the old 1996 Corolla was no longer reliable for her. I figured the Corolla still had less than 200,000 miles on it so it was still good for some time. She assured me it was not, so we bought a new car. I do like the smell of the new car, but I have only owned three new cars in my lifetime. I can probably afford to buy a new car every 5 years, but they are just not that important to me. I always want to get my money’s worth out of any vehicle, so I tend to drive them into the ground. I bought a new car last year! I justify it by sticking with a certain price (approx. $20K) and keep it until it almost has zero value. My last car was 17 yeas old. The caveat is this: IF you can afford it. But the numbers don’t lie. Buy a car for $5k and drive it for 2 years, or have a perpetual car payment that you could fund a 529 or 401k plan with. The numbers are there. Cutting back your retirement is what you will be doing. @Bryce-I share your value regarding cars. But it’s also important for your spouse to feel safe! Another great example of the “personal” in personal finance. @Krantc-That’s my philosophy as well. My car is a 1998 suv with 120K (Which I bought new). I expect to drive it into the ground. PS I am very attached to this car! @Tony-So much depends on your values and cash flow! My opinion is to drive your car into the ground before you get a new one. As long as it is safe and gets you from point A to point B then don’t get burdened with a fat car payment! People get attached to their cars. Most will not be willing to trade-in their old car for another; maybe if they get a good deal. I love cars, Whenever new models comes then i sell them privately before buying a new car. A person can probably make a few thousands bucks by going with a private sale. However, there is no problem with getting a new car if you have your financial house in order and are on target to hit your goals and you are able to do that changes in life – Sometime changes brings happiness and add new memories to your happiness list. @Car-I agree that selling cars privately, before buying a new one is usually a lot more lucrative. And you stated quite clearly that if you love cars, and have your financial house in order, then why not buy a new car. Thanks for chiming in! It all comes down to find the right car at the right time, at the right price. It will take a long though process when buying a new car. It also always good to get some outside advice and opinions.